The Mueller Report: Will We Ever See the Whole Thing? A day has passed since Attorney General William Barr issued his four-page summary heard ’round the world. As we now know, special counsel Robert Mueller found no coordination between the Trump administration and Russia. But beyond that important conclusion, we’re left with a lot of questions. Intelligencer staffers Jonathan Chait, Benjamin Hart, and Ed Kilgore discuss the fallout from a momentous weekend. Ben: There was obviously a lot riding on Robert Mueller’s findings, and his conclusion that there was no coordination between Russia and the Trump administration is unambiguously good — very good — news for President Trump. But we’re still dealing with a scant amount of information here: just the four-page summary from Attorney General Barr that takes a “nothing to see here” attitude on the question of obstruction of justice. What do you think the odds are that we’ll see the full report soon — or ever? Jon: My guess is the odds are high, but I truly don’t have much confidence in that. Ed: We’re hearing positive signals from the administration, but then again, I don’t trust them as far as I can throw them. So: don’t trust but verify! Jon: My sense is that if it goes to a court fight, Democrats have a good chance. Ed: There’s also the question of redactions. Does “full” really mean “full”? Ben: Do you foresee a document in which all words are crossed out except “Trump” and “not guilty”? Jon: Like the very short version of a blurb on the poster of a terrible movie. Jon: Look, I buy the underlying claim that Mueller did not find any crimes he could charge Trump with. I’m 99 percent confident the full report will not yield any collusion-related crimes. With the obstruction parts, there could be some new pieces, but if you’re not going to charge him after he told Comey to let Flynn go and then fired him and then dangled pardons on Twitter, then you’re never going to charge obstruction. Ben: Right. As both of you wrote about yesterday, Barr asserted that Trump couldn’t have obstructed justice, because the underlying crime he was obstructing didn’t exist. This seems like faulty logic. But then again, even if we see the full report and there’s a much better case for obstruction than Barr signaled, where does that leave Democrats? I don’t sense there’s going to be much enthusiasm to prosecute that angle further, among them or the public. ﻿Ed: What I’ve called the “no harm, no foul” approach to obstruction pretty much rules anything out if an underlying crime isn’t alleged. Jon: I am sure hearings will continue. ﻿Ben: Hearings, yes, but it’s hard to imagine a world in which this is the thing Nancy Pelosi wants to focus her energy on. Jon: It never was. And to be clear, just because I’m interested in a topic, doesn’t mean I think Democrats should make it their message. I do think it does generally throw the press corps on the defensive. Ed: I just wrote about the odds of impeachment really fading now. Aside from the fact that the Mueller investigation seems to have become a dead end, there’s the little problem of the calendar. I could see House Democrats continuing to churn up evidence that’s of use in 2020, but 2020, not some illusory preelection removal of Trump from office, is now paramount. Ben: As it has been among the candidates running for president the whole time. Ed: Well, yeah, the first 2020 candidate debates will be in June of this year. That’s really soon. Unless candidates are going to promise to impeach and remove Trump if he beats them, the issue is rapidly becoming moot. Ben: None of us are Donald Trump fans here. But is part of you, you know, relieved that our president wasn’t colluding with a foreign power? Jon: What scenario did you fear that has not turned up? Trump speaking directly to a Russian government official and asking them to hack the DNC emails beforehand? Ben: A much more coordinated, quid pro quo effort between the Trump campaign and Russia — their help in exchange for a soft stance toward Putin, for example. Jon: That doesn’t seem wildly worse than him asking Russia to do it through the TV. Ben: I think it does. Ed: I might be relieved a bit more if I were not half-convinced Trump will refuse to leave office if he loses in 2020, on made-up “voter fraud” grounds. Jon: The thing about quid pro quo is that it’s not clear from Barr’s summary that this possibility was ruled out. I mean, that’s not a crime. A lot of very bad possible or reported actions are not crimes, or would be hard to prove in court if they were. Ben: Ed, I’m not saying relieved in an overall sense, just maybe grateful that our president isn’t actually a Russian agent. Jon: I never worried he was a Russian agent. Ed: Me either.He’s too self-centered to serve a foreign power. Ed: I still worry that Russia’s influence is based on perceived mutual interests and values. Trump’s close friends around the world are mostly bad actors. Ed: Presumably that would get into noncriminal influence, if there is any. Jon: Exactly. I’m assuming Cohen’s testimony was correct, that Trump anticipated a several-hundred-million-dollar payday from the Moscow project. Dangling lucrative business deals is a well-worn Russian method of cultivating foreign pols. It doesn’t mean they own them, but it gives them a lot of influence. Ben: In the aftermath of the Barr letter, what is the most important question surrounding Trump and Russia that’s left dangling? Ed: Um, I’d say Mueller’s actual findings on obstruction are still a pretty big deal. We know he punted, but we don’t know how many yards he had to go. Jon: Barr said “most” of the obstruction has been reported, but most could mean anything from 51 percent to 99 percent, so there’s some mystery there. I’m pretty curious if they find out what the 75 pages of polling data Manafort gave Kilimnik was for. Probably not, since Manafort kept the omerta, but that would be interesting. Ben: And then there’s the pee tape. Real or very real? Ed: That just earned you an extra stretch in the media reeducation camps to come. Jon’s already in solitary for the duration. 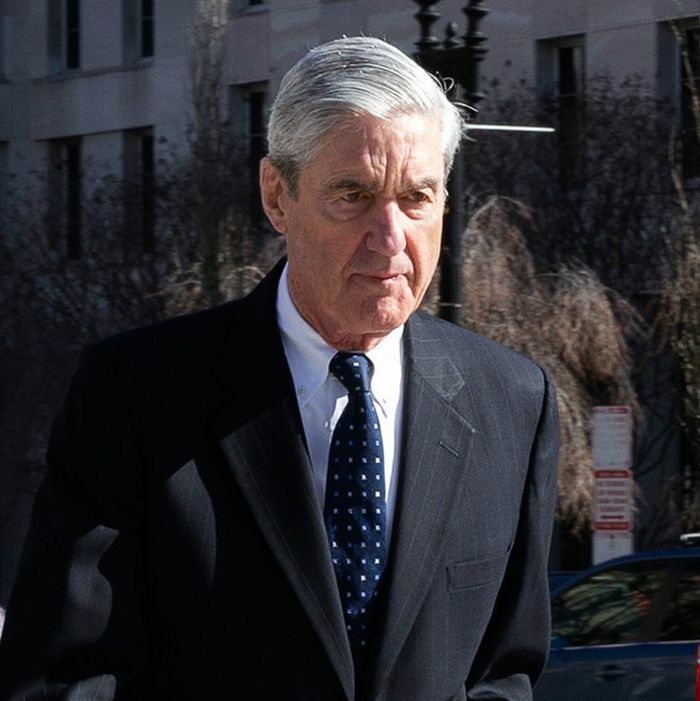 Intelligencer Chat: Will We See the Full Mueller Report?